Do we see how much we live in inner conflict when we label our feelings as 'good' or 'bad': love, gratitude, joy, pleasure etc ... are the good feelings while anger, fear, grief, shame, regret, guilt etc ... are the bad ones ... and we are constantly repressing or suppressing the bad feelings, seeking to replace them by the good ones. Hence we live in constant dichotomies: likes and dislikes, attracting the ones and rejecting the others. So can we learn to embrace all of our feelings and experiences, without judgement, without resistance to 'what is' ? It seems to me that your posting is essentially a (fairly subtle) division into good/bad right/wrong. Good/right: Embrace "all of our feelings and experiences, without judgement." Bad/wrong: The conflict that arises from not doing this. If so, the posting comes from the same judgemental-ness that it questions. rachMiel wrote: It seems to me that your posting is essentially a (fairly subtle) division into good/bad right/wrong. Right RM, so before 'doing' anything we must first understand how it works, how an emotional reaction arises. Let us see what happens in an example: I am walking in the street and for some reasons, a man starts to shout at me and insult me. Immediately there arises in me an emotional reaction, right ? I feel hurt and maybe I will react emotionally to this 'challenge' or threat perception by shouting and insulting back. After all, why would I care about this unknown man shouting at me and insulting me ? Does the opinion of this man have any importance to me, why let him 'trigger' my emotional reaction, upsetting me, 'pushing my buttons' ? So what happened exactly ? Is it reasonable to do so ? Of course not, because the opinion of this man insulting me has no importance for me as an adult ... so there is no need to react to it. I can perfectly stay with the challenge, and instead of reacting out of an emotional defense, bring an adequate response (which is not a 'reaction') like : why do you feel the need to insult me ? So we see that we are in fact totally responsible of our own quality of experience, we are deciding (mainly unconsciously) of our own emotions. So why let others 'push our buttons' any more ? So what if we have our buttons pushed and we have an emotional reaction? Why is that a problem? It's just an experience in a stream of experiences. If we try to be nonreactive, then we may repress our emotions and reactions.....by trying to be spiritual and non dual. Whereas if we react, throw an insult back and move on, we are in the moment and processing the incident in real time and then forgetting the whole thing. It seems what you are talking about is an extra step of suppression. Over time, this style of suppression in the name of spirituality could be quite harmful emotionally. Are you saying a spiritual person never has their buttons pushed and never feels an emotional reaction? That this is something we should try to attain? I prefer to think of emotional maturity as being able to be in the moment as your buttons are pushed, feeling the emotional reaction of anger, shame, or whatever, and then processing these feelings rapidly before acting on them. I think it's the speed of processing that is key and the reflection before reaction, not the emotional reaction in the first place. We all have bad days where we are more emotionally reactive for whatever reason. Emotions are an integral part of being human, let's not become automatons in the name of spirituality. Onceler wrote: So what if we have our buttons pushed and we have an emotional reaction? Why is that a problem? It's just an experience in a stream of experiences. If we try to be nonreactive, then we may repress our emotions and reactions.....by trying to be spiritual and non dual. Whereas if we react, throw an insult back and move on, we are in the moment and processing the incident in real time and then forgetting the whole thing. Phil2 wrote: So we see that we are in fact totally responsible of our own quality of experience, we are deciding (mainly unconsciously) of our own emotions. Would you say that a paranoid schizophrenic is totally responsible for their quality of experience? How about a war veteran with severe PTSD? Or someone with Asperger syndrome? I think your assertion is on the right track, but needs to be softened to something like: Most of us are largely responsible for our own quality of experience. Of course you cannot decide of your outer physical conditions or life circumstances, but you can decide how you feel under those conditions. 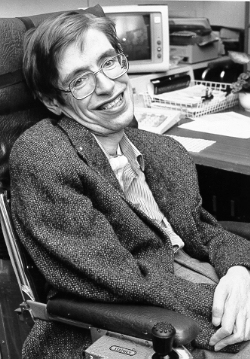 A good example would be Stephen Hawking who is almost entirely paralysed due to a muscular sclerosis and communicates through a speech-generating device, however he declares that he is perfectly happy. He could have decided to be a victim of life and make a depression, but he chose to be happy. Each one decides of his own emotional state. There is no exception. rachMiel wrote: I think your assertion is on the right track, but needs to be softened to something like: Most of us are largely responsible for our own quality of experience. Respectfully, I think this is a blind spot in your understanding, M. Jean. Phil, what about Down syndrome, autism, mental retardation..... I won't even mention mental illness, since I know how you get. Oops, I guess I just did. Btw, who's Pablo?.. who's M. Jean? Pablo and Jean are names from a parallel online reality we both inhabit(ed). rachMiel wrote: Pablo and Jean are names from a parallel online reality we both inhabit(ed). Must be an inside joke. We are survivors of a very strange and often savagely dysfunctional forum that centered -- or was *supposed* to have centered -- around the teachings of Krishnamurti. Ahh, I see. I just wonder how you figured out Phil was M. Jean and how he knew you were Pablo? Anyways, doesn't matter, but that's funny. Yes, we have history. Many a talk have we had, few (if any) a conclusion have we reached. Until you can actually put yourself in the shoes of a mentally retarded person (which you will in your life review) as an act of love, or an autistic person or a person with a congenital brain disorder, you will never know what they experience and what they can and cannot control, so who am I to suggest that I actually do know? I would not suggest one way or another that I do know what these people experience. I'd say I simply do not know what they experience because I haven't been there and neither have you. To claim you do know when you clearly don't, is merely imposing your own limited judgement on to 'what is'. It's the same as saying, 'this is how it should be, because I think this way. Therefore, everyone else must also'. That's what we define as classic 'judgement'. Perhaps a severely mentally disabled person can be responsible for their own experience. Yet, can we say this for certainty that we can possibly know this right now with our own experience, without being in their shoes? If you say yes, then I say you're lying.